Frederick George Garrett, known as Fred, was born in Sherborne, Dorset, in April 1894 the son of railway platelayer George Garrett (1869-1923) originally from Bradford Abbas, Dorset, and gaiter maker Rose née Plympton (1870-1938) originally from Rimpton. In the 1901 census George, Rose and Fred were listed living at the Railway Crossing, Worth, Sussex. In 1905, while living at Three Bridges, Sussex, George and Rose had a second son, Geoffrey Mark. By the time of the 1911 census the family had moved to Yeovil and the census recorded them living at New Buildings, Clifton Wood, Yeovil. At this time George was working as a farm labourer and Fred was a machinist working for Aplin & Barrett. He is known to have later worked as a stable-man at the Co-operative Stores, Huish and, immediately prior to enlisting, as a gardener. Fred enlisted at Sherborne on 8 December 1914 at the age of 20 years and 9 months. He enlisted as a Private in the 2nd/4th Battalion, Dorsetshire Regiment, with the Service Number 12584. The 2nd/4th Battalion (presumably not including brand new recruit Fred Garrett at this time) embarked at Southampton for India, arriving at Bombay in early January 1917. Whether or not Fred joined his battalion in India after basic training is unknown but likely since they remained in India until they were sent to Egypt. On 15 August 1917 the battalion embarked at Bombay for Egypt, arriving at Suez on 29 August 1917. On arrival the battalion transferred to 234th Brigade of 75th Division and engaged in various actions as part of the Palestine Campaign. The battalion's first engagement was the Third Battle of Gaza, when in late October and early November they held the front line for a fortnight during which time they repulsed three Turkish attacks (several battles fought for the Gaza to Beersheba line between 31 October and 7 November, were all assigned the title Third Battle of Gaza, although they took place many miles apart and were fought by different corps). The Third Battle of Gaza was fought on the night of 1/2 November 1917 between British and Ottoman forces during the Sinai and Palestine Campaign and came after the Egyptian Expeditionary Force victory at the Battle of Beersheba had ended the Stalemate in Southern Palestine. The fighting occurred at the beginning of the Southern Palestine Offensive, and together with attacks on Hareira and Sheria on 6–7 November and the continuing Battle of Tel el Khuweilfe which had been launched by General Edmund Allenby on 1 November, it eventually broke the Gaza to Beersheba line defended by the Yildirim Army Group. Despite having held this line since March 1917, the Ottoman Army was forced to evacuate Gaza and Tel el Khuweilfe during the night of 6/7 November. Only Sheria held out for most of the 7 November before it too was captured. The battalion was next engaged in the The Battle of Nabi Samwil, (17–24 November 1917), which was fought during the decisive British Empire victory at the Battle of Jerusalem between the forces of the Egyptian Expeditionary Force and the Ottoman Empire's Yildirim Army Group during the Sinai and Palestine Campaign, The battle of Nabi Samwil, was the first attempt by the forces of the British Empire to capture Jerusalem. The village of Nabi Samwil was part of the Ottoman defences in front of Jerusalem and its capture was considered vital to the eventual capture of the city. The British attacking force consisted of three divisions, two infantry and one mounted. Whether or not Fred was engaged in this battle is unclear as he may have been on home leave, certainly he was aboard His Majesty's Troopship Aragon at the end of December 1917. HMT Aragon, originally RMS Aragon, was a transatlantic Royal Mail Ship that served as a troop ship in the First World War. She was built in Ireland in 1905 and was the first of the Royal Mail Steam Packet Company's fleet of 'A-liners' that worked regular routes between Southampton and South American ports including Buenos Aires. In 1913 Aragon became Britain's first defensively armed merchant ship ("DAMS") of modern times. In the First World War she served as a troop ship, taking part in the Gallipoli Campaign in 1915. In 1917 a German submarine sank her in the Mediterranean, killing 610 of the personnel aboard. Unfortunately Fred was among those killed in this action. He was aged 23. In its edition of 8 February 1918 the Western Gazette reported "Private F Garrett of the Dorset Regiment, whose parents reside at 146 Park Street, is officially reported missing, believed drowned. Prior to enlistment in December 1914, he was engaged as a stable-man at the Co-operative Stores, Huish. He had previously suffered from dysentery and trench feet, and had also been wounded." 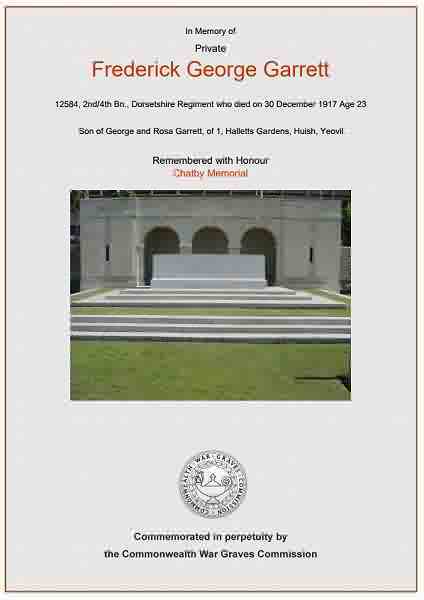 Frederick Garrett is commemorated on the Chatby Memorial, Alexandria, Egypt, and his name is recorded on the War Memorial in the Borough. The Commonwealth War Graves Commission certificate in memory of Frederick Garrett.